Who wants to cook on Christmas Eve? Well some people, but I’m sure more prefer to be on the receiving side of that equation. So why torture yourself? Enjoy a wonderful French Christmas dinner at Le Parisien. There are selections for your courses so I’m sure there is something for you and your family to enjoy. I think my choices would be the Baby Spinach Salad & Warm Duck Confit appetizer, Roasted Duck Breast entree, and Raspberry Souffle Crepe dessert. I do adore duck. Pair the duck with a violet scented Pinot Noir or juicy Merlot and I’m set for the evening. Here is the announcement for the dinner from Le Parisien. Joyeux Noel. In Paris, Nuit de Noel (Christmas Eve) is a time to spend feasting with friends and family. Whether your Nuit de Noel tradition is to attend a carol service, stay at home, go to a movie or visit friends, consider joining us for dinner that night. As your neighbourhood French bistro, we offer a warm, family-friendly environment in which to enjoy good food and the joy of the season. Give the cook in your home an early Christmas present – our four-course prix fixe menu is only $45 and you’ll leave as full as a Christmas stocking. This announcement by Liberty Wine Merchants in Vancouver just came through my email. 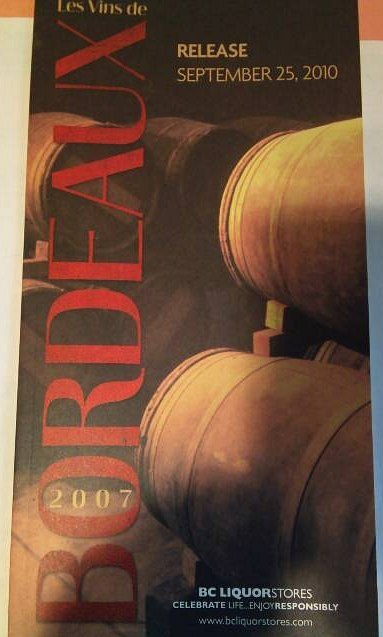 If you are a Bordeaux fan, you may want to pick up some of the 2009 vintage. From a quick look I notice that all are primarily Merlot with lesser amounts of the other Bordeaux varieties. Bordeaux 2009 is a brilliant vintage in which Chateaux have crafted truly exceptional wines! Pleasing aromas of blackcurrant and raspberry. Very ripe fruit on the palate backed by silky, mellow tannins. A superb expression of balance, harmony and smoothness. Notes of black raspberries, liquorice, graphite, and cassis, wonderful intensity, purity, richness, and overall balance, and a stunning finish. An elegant wine, smooth and rounded. Fruit-forward with plum, cherry and black fruits, complimented by toast, vanilla and tobacco. Floral notes combine with black fruit, vanilla, white pepper and a touch of licorice. Strong, yet smooth highlighted by ripe blackberry. A spicy, peppery nose of plum, blackberry confit and minerals. The palate is fresh and well defined with mouth-filling cassis and chocolate with liquorice, mocha and vanilla spice. Enticing aromas of ripe berries, backed by a hint of vanilla. Lovely notes of earth and fresh herbs enhance the fruit-forward palate, and merge with round, soft tannins on the finish. This great value red delivers heaps of black cherry, currant and plum flavors, with tobacco, chocolate and toast. The firm tannins are well-integrated, and the finish is smoky and fresh. Deep colour and pure aromas of blackcurrant and raspberry, overlain with vanilla and spice notes from the oak maturation. A soft-textured wine, with sufficient tannins. Stock varies by location. Please consult your Liberty store to ensure availability. 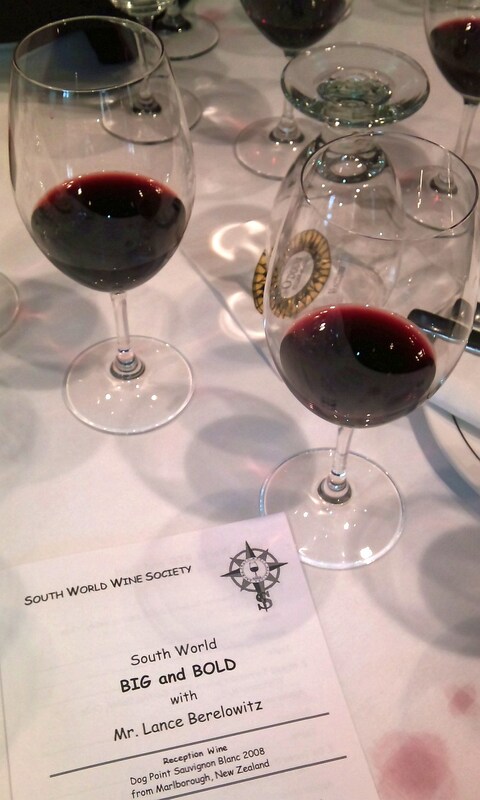 Last night we were treated to big red wines from the Southern Hemisphere. In particular, 2 wines from each of Chile, Argentina, South Africa, and Australia. These are all premium wines in the $30-$40 range per bottle. Our speaker for the evening was Mr. Lance Berelowitz, one of the South World Wine Society‘s co-founders, past President and past Cellar Master. Lance is originally from South Africa, but has travelled extensively and has visited Australia, Chile, and Argentina, and provided to us in depth descriptions about each of these wines and regions. The Alta Cima Premium Reserve 2002, Lontue Valley, Chile is a Bordeaux blend with 85% being from Cabernet Sauvignon, and the remainder coming from Merlot, Syrah (not Bordeaux), and Petit Verdot. Alta Cima is a family run winery in Chile in the Lontue Valley which is part of the Curico Valley. This wine was deep garnet from the core to the rim, not showing it’s 9 year of aging yet. Vanilla, oak, dark cherry sweet spice, meaty and pencil lead aromas filled the glass. Quite complex. Medium body on the palate, with cherries and blueberry flavours. Medium acidity and tannins. Round in the mouth but not quite full bodied. A nice balanced wine. Next was the Miguel Torres Cordillera 2001, Central Valley, Chile. Miguel Torres, originally from Spain, has a great reputation around the world for their wines, and for opening wineries in other parts of the world. The Cordillera is a blend primarily with Carignan and lesser amounts of Merlot and Syrah. Deep garnet in colour. A light nose with whiffs of oak, black olives, and dark cherries. Medium body with dark sweet fruit, and some tar and pepperiness. Quite soft and round in the mouth, with a puckering finish. The De Toren Diversity 2003, Stellenbosch, South Africa followed. This is another family run winery. Their Fusion V is a cult wine amongst wine enthusiasts. This wine is a blend of 5 Bordeaux varieties: Merlot, Cabernet Sauvignon, Cabernet Franc, Petit Verdot, and Malbec. Medium garnet with slight bricking on the rim of the wine, indicating it’s age. Meaty, pencil leads, earthy and red fruits on the nose. Medium body with dried red and black fruits, low acidity and tannins. We all agreed that this wine is past it’s prime and we were sampling it on it’s way down. 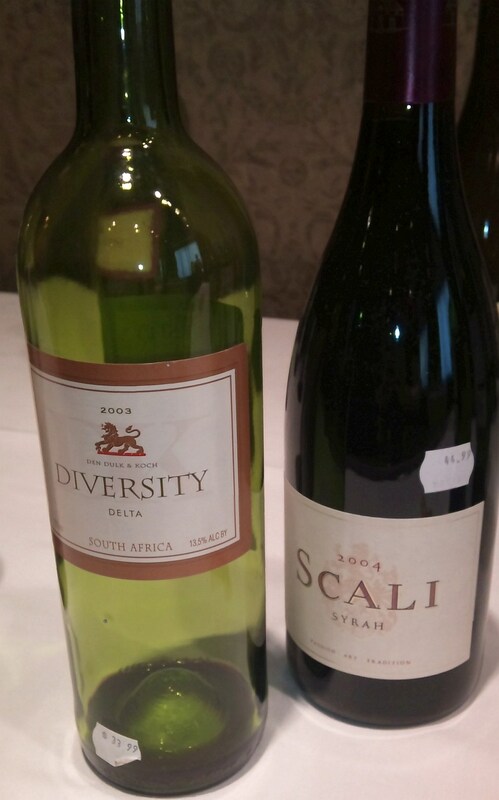 My favourite wine of the evening was the Scali Syrah 2004, Paarl, South Africa. Paarl is more inland than Stellenbosch, affording a warmer climate, which the Syrah grape loves. Deep garnet to the rim in the glass. Smoky, raspberries and oak on the nose. On the palate an array of flavours including smokiness, chocolate, coffee, dark fruit and spice. Medium plus body with medium acid to keep the flavours bright. Long length. An excellent wine. The first wine from Argentina was the Norton Malbec Reserva 2005. This is from the famous Mendoza region of Argentina, which is well-known for Malbec. It is a high altitude desert that is fed with the precious water from the Andes Mountains. This wine had a light nose with some mint and plum. Medium body with dark fruit and oak. Soft tannins. The group tasting the wine today also agreed that this wine was just OK. Not very complex. On the other hand the Alzamora Malbec Roble 2006, San Juan, Argentina was quite complex and interesting. The San Juan region is to the north of Mendoza. Not as well known, but produces very nice wine, if this wine is any indication of quality. Deep ruby in colour. Light nose with oak, dark fruit, plum, coffee and a bit of eucalyptus aromas. Full body with firm tannins. Dark fruit flavours with medium acidity and a dry finish. This wine paired nicely with the Poplar Grove Tiger Blue Cheese Puff with stone fruit compote. On to Australia. Our first wine was the Two Hands Gnarly Dudes Shiraz 2006, Barossa Valley, Australia. The two owners of Two Hands are similar to négociants from Burgundy. They do not own vineyards, but work with vineyards to produce wines to their particular standards. This wine had some sediment in the glass, which we thought could be tartrate crystals. These crystals can form when the wine gets too cold. It is a natural process, and should not be considered a fault in a wine. The wine was deep purple in the glass but was cloudy and not clear. I am not sure if this wine was filtered, but if unfiltered, you could get this cloudiness. Nice nose with eucalyptus, vanilla, ripe dark fruit and chocolate. Medium plus body with soft, round mouthfeel. Ripe cherries, chocolate and spiciness on the palate. This wine was the favorite of the room this evening. The last wine was the Peter Lehmann Mudflat Ebenezer Shiraz 2004, Barossa Valley, Australia. This is an interesting wine as the shiraz is blended with a few percent of the white muscadelle grape to add in some aromatics. Medium garnet in colour. Light nose of vanilla and dark fruit. Round with soft tannins. Blueberries, vanilla, cloves and some salty minerality on the palate. A good balance of oak, fruit and acidity. On Friday, June 17, 2011, you will be able to sample some fantastic wines from Chile, and help support the BC Hospitality Foundation’s Dish & Dazzle. What is the BC Hospitality Foundation? The Foundation was formed in 2006 to help wine agent Michael J. Willingham pay for a costly surgery and subsequent rehabilitation following a stroke. Michael’s situation highlighted the need to establish a trust fund that could be used as a last-resort safety net for other industry members in need – who may or may not have benefits, be covered by employment insurance, or require assistance beyond traditional medical benefits. The Foundation benefits will cover people in the industry – food suppliers, hoteliers, media, publicists, retailers, vintners and wine sales representatives (from BCHR website). Dish n’Dazzle, will be a showcase for Vancouver’s dynamic hospitality industry. Restaurants, wineries and premium liquors will be featured in the main “tasting room” and guests will move from station to station in an interactive, informal setting. Vina Errazuriz Max Reserva Carmenere 2007 (Chile). This wine spent 12 months oak aging. 2007 is the first vintage for the vines selected for this wine. It had a deep purple color in the glass. Cassis, smoke, black cherry, and oak on the nose. Black cherries, vanilla and cassis flavours. Smooth tannins. It had a long length, with a spice and red cherry finish. Highly recommended. Montes Alpha Carmenere 2007 (Chile). This wine was deep purple in the glass. Capsicum, back fruit and vanilla aromas. On the palate I tasted red and black cherries, vanilla and a slight hint of capsicum. This wine had a soft, round mouth feel and a long length. Viu Manent Reserva Carmenere 2008 (Chile). Deep purple colour in the glass. Vanilla, black fruits and a slight hint of capsicum on the nose. It was quite round in the mouth, with vanilla and ripe black fruit flavours, and a peppery finish. In case you didn’t know, the theme country for next year’s Vancouver Playhouse International Wine Festival is Chile, so come out to this event, and get a sneak peek at what you can expect next year, and maybe find a few new favorites for this summer! Here is the website for tickets for the BC Hospitality Foundation Dish & Dazzle. Enjoy! It has been long overdue. A trip to Vancouver Island, and to visit some Island wineries. 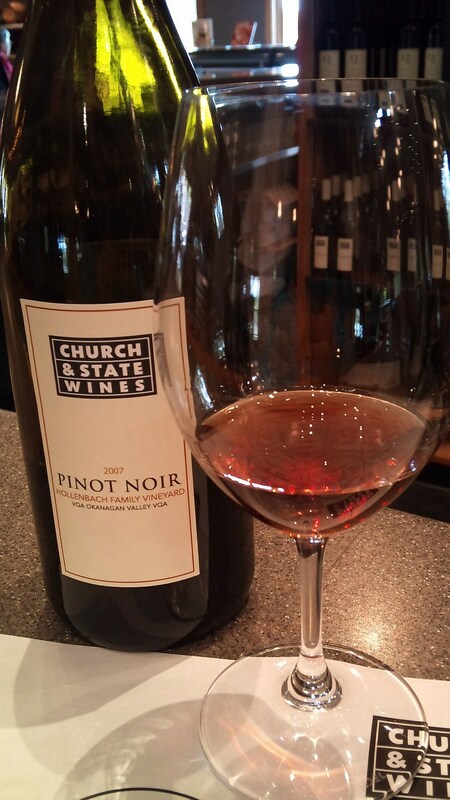 I have enjoyed wines from Church & State for the past few years, but have never been to their winery in the Brentwood Bay area of Vancouver Island. They also have a winery in the Oliver area. At Brentwood Bay they grow the wine grapes to produce their sparkling wines and some white wines, while the red wines and some white wines are produced at the Oliver area winery. I’ve written about their Chardonnay in the past and was lucky to try a sample at this tasting as well. Their Chardonnay 2008 has won Double Gold at both the San Francisco International Wine Festival 2010 and the All Canadian Wine Championships 2010, and a Silver at the Challenge International de Vin in France. This wine comes from 2 vineyards in Oliver. It is medium lemon in colour. Nice nutmeg and lemon aromas. 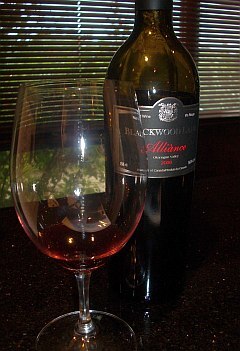 Round mouth feel with medium body and softness on the palate. Low acidity. Very elegant. The Pinot Gris 2009 comes from Estate grapes at Brentwood Bay. Pale lemon in colour. Oak, lemon and peach on the nose. Peachy, sweet spice and almond flavours. Medium length. Nice. 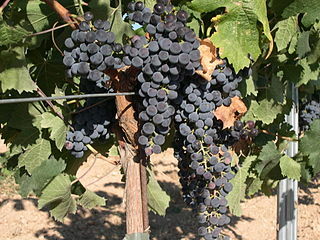 Their Pinot Noir 2007 – Hollenbach comes from Skaha Lake grapes in the Okanagan. This is another Gold medal winner from the Canadian Wine awards 2009 and the Okanagan Fall Festival 2010, and several other awards. Light raspberry and tarry aromas. Light body with tea leaves, strawberries and cinnamon flavours. Soft in the mouth with a dry long finish. Very nice. The Merlot 2009 is medium garnet in colour. Light cherry, oak, and spicy aromas. Medium body with lots of plummy and black cherry flavours. A bit of flowers and spice on the finish. Medium acidity and tannins. The Meritage 2006 is a blend of three Bordeaux varietals – Merlot, Cabernet Sauvignon and Cabernet Franc. Deeper garnet in colour. A very wild nose! Animal and overripe black fruit. Meaty, animal and black cherry flavours with medium tannins. A very masculine wine. Have a big slab of roast beef with this wine. Their Quintessential 2007 Bordeaux blend is coming out this week. Drop by their Brentwood Bay winery for a taste for Mothers Day, or check your local wine shop for the arrival of this wine. It has wine a Gold medal at the Challenge International de Vin in France. Enjoy! The logo for their winery is the constellation Perseus. According to Greek mythology “Born to Jupiter and Danae, Perseus was one of the most courageous warriors in the Greek mythology. His claim to fame was slaying gorgon Medusa, one of the three gorgon sisters who had the power to turn anyone who saw them into a stone. Perseus achieved this feat with a bit of help from Pluto; who gave him the helmet of invisibility, Mercury; who gave him his winged sandals and Minerva; who gave him her powerful shield. The helmet of invisibility and the winged sandals ensured that Perseus reached close to Medusa without getting noticed, while the shield acted as a mirror in which he saw Medusa while delivering the lethal blow. This heroic act earned Perseus a place in the stars, and thus came into existence the constellation of Perseus.” from Buzzle.com. What wines does Perseus produce? They have 3 vineyards to produce the grapes for their wines. Their Blind Creek Vineyard bridges the two towns of Keremeous and Cawston in the Similkameen valley. I read that they also planted whites including Chardonnay, Sauvignon Blanc and Pinot Gris, here, and are most excited by the establishment of the Rhone varieties: Viognier, Roussane and Marsanne. I too am a Rhone lover so look forward to tasting these wines once the vines are producing grapes. Their Old Station Vineyard overlooks Skaha Lake in the Okanagan Valley our vineyard and sits between the city of Penticton and the Town of Okanagan Falls. Their last vineyard, Lower Bench Vineyard, you will see when you visit their tasting room and wine shop in the Okanagan valley. It is a 2 minute drive from Penticton on the Bench to Naramata. If you have visited Perseus winery, please comment in the blog and let me know what you think of their wines. I am very interested in getting some info. Cheers! Poplar Grove Wine Alert Special! I received this email about a mixed case special of wines from the Okanagan’s Polar Grove winery, so I thought i’d pass it along. Might be very useful for upcoming Christmas parties. Cheers. We are thrilled to introduce Poplar Grove Winery – a new partnership and highly recognized BC Winery to Trialto Wine Group‘s portfolio. To celebrate our new partnership Poplar Grove and Trialto Wine Group wanted to offer our friends a one-time special offer of a mixed case selection from Poplar Grove Winery. This mixed case selection is a wonderful opportunity to taste through the exciting wines from Poplar Grove or could be a perfect gift for the upcoming holiday season for your friends, colleagues, and family. Please contact Lesia Knowlton at (604) 320 7322 or lesia.knowlton@trialto.com by Friday November 12th to place your order. Your mixed case of Poplar Grove Wines will be ready to pick up at Kitsilano Wines on Saturday November 20th. Bordeaux 2007 Release Preview. What to Expect? Today the Cambie Street BC Liquor Store had a pre-release showing of six red Bordeaux wines from the 2007 vintage. As expected, the tasting area was packed full of people wanting to get a taste of what to expect with the BCLDB releases all their 2007 Bordeaux inventory on September 25, 2010. The 2007 vintage I was told at this tasting was a cool year. So do not expect, big, full-bodied reds. Expect a leaner, lighter style. Also expect the blend to change, as it does every year. Cabernet Sauvignon loves heat, while Merlot does very well with cooler temperatures, so for this cooler vintage, expect to see a greater percentage of Merlot in the blends. The Chateau Belle Vue is a 70% Merlot / 20% Cabernet Franc / 10% Cabernet Sauvignon blend. Deep garnet in the glass. A very nice colour. Quite smoky aromas, along with black berries and cherries. Firm tannins with bright cherry fruit and a medium length. Good to drink now. 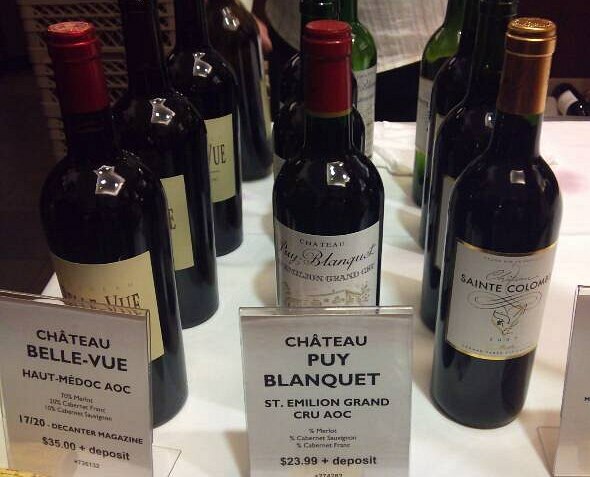 I do like the wines from the St. Emilion region and was looking forward to trying the Chateau Puy Blanquet . It was light garnet in colour with aromas of red cherries and a bit of vanilla. Soft mouthfeel with red cherries flavours. The tannins built as you kept the wine in your mouth longer. Thin body and short length. I was hoping for more. Chateau Sainte Colombe is a blend of 70% Merlot / 20% Cabernet Franc / 10% Cabernet Sauvignon. Medium garnet colour. Closed nose, but I was able to pull out some capsicum, vanilla and cherries. On the palate, it was quite round, with cassis, red cherries and oak flavours. Medium tannins and medium length. Not bad. Maybe with a bit of time exposed to the air, the nose would have opened up more. 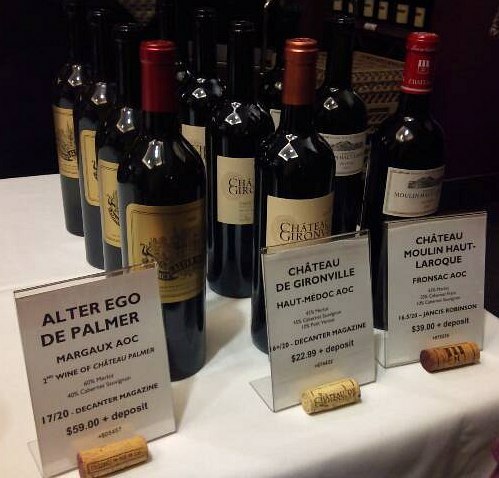 The Alter Ego de Palmer, is the second label for the well-regarded Chateau Palmer winery. This wine was a blend of 60% Merlot / 40% Cabernet Sauvignon. It was deep purple coloured in the glass. Meaty, dark cherry, cassis, and vanilla aromas. Full bodied, with ripe cherries, vanilla, and medium fine tanning. It had a very nice cherry finish and a long length. Overall my favorite of all six wines, but comes with a $59 price tag. Clearly not the most expensive of the upcoming Bordeaux releases (which can be easily $600+), but I think would be a special occasion wine for many people. The Chateau de Gironville is a blend of 45% Merlot / 45% Cabernet Sauvignon / 10% Petit Verdot. Opaque purple in the glass (courtesy of the Petit Verdot). A very aromatic nose. Lots of coffee of black cherry. On the palate you get firm tannins, with black cherry, coffee, and vanilla flavours. Full body with long length. I personally purchased a bottle of this wine. A nice price point at $22.99. The final wine was the Chateau Moulin Haut-Laroque. Opaque purple/garnet in the glass. It had a chemical / woody nose that I did not particularly enjoy. Medium body, with cassis and cherry flavours. Round mouthfeel but an astringent finish. Maybe this wine needs a few years to evolve in the bottle? I’d advise those of you going to buy the 2007 red Bordeaux’s to do some research online to find out what other professional reviewers have said about the wines. Do not forget that there will also be white Bordeaux being released. With the cooler temperature of the 2007 growing season, this gives the semillon and sauvignon blanc grapes plenty of time to mature on the vine and to keep their fresh fruitiness and good acidity. It also I am told was very good for Sauternes. Be sure to line up early at the Cambie St specialty wine store on September 25, 2010! Enjoy. Our last long weekend, Labour Day, is upon us. Soon the rains will start here in BC. So fire up the BBQ for maybe one last great hurrah, and open a bottle of a BC Bordeaux blend. When I speak of Bordeaux blend, in this blog I’m talking about red wine. There is a white Bordeaux blend, but I’ll cover that in a different blog. In a red Bordeaux blend, you can have a blend of up to the following different grapes: Cabernet Sauvignon, Merlot, Cabernet Franc, Petit Verdot, Malbec and Carmenere. Malbec and Carmenere are rarely used in Bordeaux now as they were hard to harvest to ripeness and most of the vines are gone. In Bordeaux due to the variations in the climate each year; sometimes a cooler year, and sometimes warmer, you needed to blend earlier ripening and later ripening grapes in order to get a good wine. In the Okanagan, we are blessed with fairly good weather every summer so we can do single varietals, but still blending adds additional complexity to the wine. Van Westen Vineyards Voluptuous Merlot / Cabernet Franc 2006 Deep reddish purple. Light aromas of cherry, cedar and slight herbaceousness. Round mouthfeel. Dark fruit liquor, cherry and plum flavours with a vanilla finish. Poplar Grove Legacy Merlot / Cabernet Franc / Cabernet Sauvignon / Malbec 2004 Black fruit aromas with a slight wisp of capsicum. Round mouthfeel with dark fruit and firm tannins. Dry with a black cherry finish. Howling Bluff Sin Cera Merlot / Cabernet Franc / Malbec 2007 Deep purple with a red edge. Smoky, dark fruit aromas. Dark fruit, cherry and spicy flavours. Spicy / cherry finish. Firm tannins. Black Widow Winery Hourglass Merlot / Cabernet Sauvignon 2007 Nice nose with casis, cherry, plum and vanilla. Fruit forward. Black cherry, plum and some vanilla on palate. Medium length. Therapy Vineyards Freud’s Ego Cabernet Sauvignon / Cabernet Franc / Merlot 2007 Medium garnet with slight purple colouration. Oak, cherry, currant and cedar aromas. Cherry, red and dark berries, and vanilla flavour. Round mouth feel, soft tannins. Cherry finish. I have many more in the list, but to keep it brief, I’ve listed just a few. I hope you enjoy your Labour Day long weekend with a red BC Bordeaux blend. I’m a University of Alberta graduate. It was a while ago, and I keep getting invites to alumni events, but never joined in until yesterday. The alumni were getting together at River’s Bend Winery in Surrey, BC. As I love wine, I was compelled to join. It was quite easy to find the winery (15560 Colebrook Road). I’ve attached a Google map for you. I wasn’t sure what to expect, but the alumni were friendly and I hope to meet some again soon to talk about wine. Most of the grapes come from their estate in Surrey. I checked out the grapes. Some of their red grapes were starting to turn red (they are originally green btw). This process is known as veraison. There’s a good Scrabble word. So how were the wines at River’s Bend Winery? Well, they have a gamut of wines: white, red, blush, and dessert. Of the white wines, I think my favorite was their Viognier 2007 ($20). The grapes come from Oliver. It was watery lemon in colour, with perfumy, apple, lychee, and peach aromas. Light in body, with apple, peach and some spice. Medium length. Also notable was their Pinot Gris 2008 ($19). This one had a slightly herbal nose, with some peach and oak. Medium body, slightly round mouth feel, with peachy flavour. On the reds, I preferred their Merlot/Cabernet 2007 ($22). This one was also made with grapes from Oliver. I was told it has recently won a Silver Medal from the Northwest Wine Summit. Congratulations. This is a blend of 62% Merlot, 18% Cabernet Franc, and 20% Cabernet Sauvignon. Very dark garnet in the glass. Cassis, cherry, and capsicum/cedar aromas. Medium body, not too dry, with cherry and a bit of spice. Nice. If you are into dessert wines, you may want to try their Indigo, port style wine ($25). Medium garnet in colour. Oak, porty, chocolate nose. Medium body, with spicy, cherry, and blueberry flavours. Semi sweet. Went well with dark chocolate. Not a bad trip. Only 30 minutes from central Burnaby. 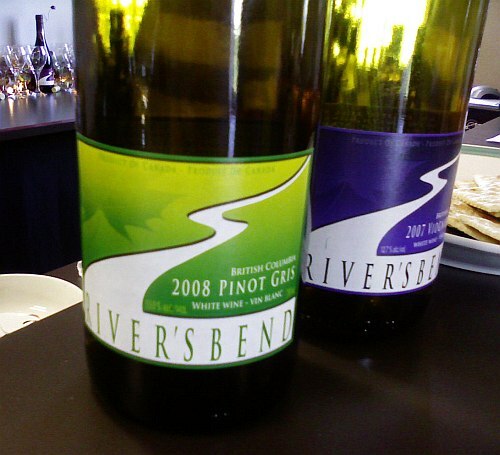 Drop by and give River’s Bend Winery a try.